Usain Bolt started his individual Olympic race by dancing some Samba before winning the gold medal in the 200-meter race on Thursday, Aug. 18. He is definitely not a stranger to winning that particular race. Bolt has been a consistent athlete and competitor, winning a total of eight Olympic gold medals. So he was definitely entitled to some celebrating after Thursday night's win. Bolt followed LeBron James' lead and broke out into the NBA star's signature winning move. And why wouldn't he be busting a move upon his eighth gold medal? Bolt's win on Thursday was historic, as he became the first man to win the Olympic 200-meter race three consecutive times. And he reached the finish line in just 19.78 seconds, according to the Washington Post. "What else can I do to prove I am the greatest? 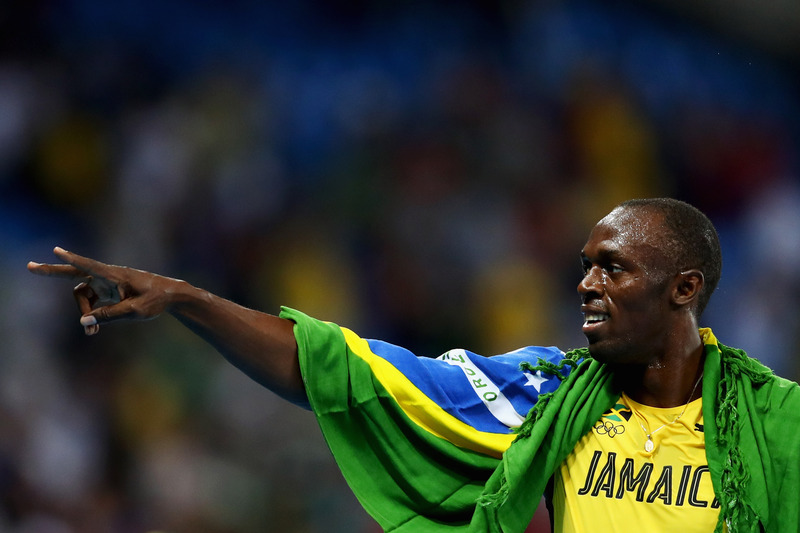 I'm trying to be one of the greatest, to be among Ali and Pele," the Jamaican athlete told BBC Sport. He added, "I hope after these Games I will be in that bracket," the Washington Post reported. When he reached the finish line, and before celebrating with his own signature lightning bolt, Bolt first broke out the Cavalier's star James' "Silencer" move, where he lifts his knees while pushing his hands down. And "King James" took to Twitter to express his support for Bolt taking a page from his book. Bolt will compete again on Friday, Aug. 19 in the 4×100 relay, which could be his final Olympics race ever. However, his Olympic career in track and field wouldn't be ending without also leaving behind an incredible name for himself in sports. LaShawn Merritt, a Team USA track and field competitor said of Bolt, "He’s created a great legacy for himself once he leaves the sport. A true champion," according to the Washington Post. Ashton Eaton, also of Team USA, added "I mean, the guy’s last name is Bolt ... You can’t write a story like that." Bolt has proven time and again that he truly is unstoppable on the track. Andre De Grasse of Canada, who finished in second place told Canadian network CBC, "I was ready to try to challenge [Bolt] and he just ran away from me and I couldn't catch him. It is what it is." And Bolt had some kind words for the Canadian athlete in return. He told CBC, "[De Grasse has] proven to the world that he's going to be a great athlete, he's going to be one of the best." Fast as a lightning bolt, you can catch the 4x100 relay race on Friday night. The race kicks off at 9:35 p.m. ET.